This past weekend, we celebrated my son Landon's 6th Birthday! I had so much fun planning and decorating for his first "friends are invited" party. Other than his first birthday which I'm quite certain he does not remember, he's never had a birthday party with friends. So being this was his first real party to invite friends, we kind of made a big deal of it. And it paid off! 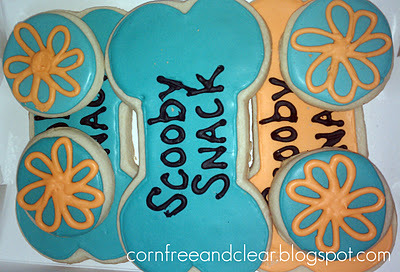 At the party, I had set up the "Scooby Snack" table with all the fixin's. Here is the list of foods that we had, including the ones that were corn-free. A co-worker's daughter had made the Scooby Snack cookies for me, and even matched the colors of the party perfectly. I think they turned out super groovy, don't you?! I used a couple of dog bowls, $1 each from the Dollar Store, for the marshmallows and grapes and just colorful bowls of various sizes, $1 each from the Dollar Store, for the other snacks. I made the food labels on my computer and printed them out myself. I hole-punched the top and bottom of each label and put an orange grosgrain ribbon through them. 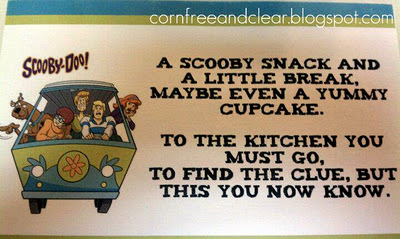 Complete with Scooby Doo napkins and plates, an orange table cloth, lime green utensils and a cupcake stand, the Scooby Snack table was adorable! 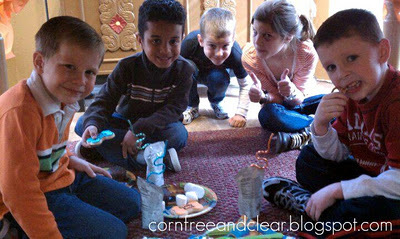 Moving on to the activities, when the kids first arrived, I had them put their presents in a basket I had out on the coffee table this made it easier for the monster to steal later and had them go in Landon's room to play a ring-toss game. The kids didn't suspect what was going on in the living room! I had the kids look around the living room for the first clue. I had to give them a few suggestions of where to look, but they finally found the clue under a chair. That sneaky monster! Here's some of the gang with their masks on. Too cute! 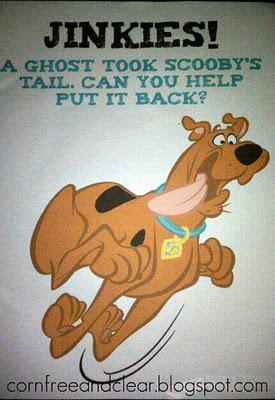 I used Photoshop to remove Scooby's tail and created a large 17x22 poster that I printed. I saved the tail I removed in Photoshop as its own image and printed enough tails for each kid at the party. I think the poster turned out good, don't you?! 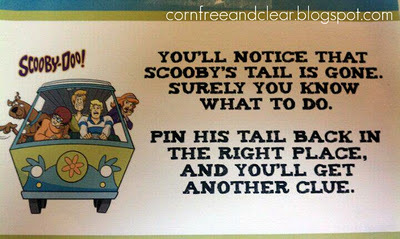 So off to play "Pin the Tail on Scooby" they went. 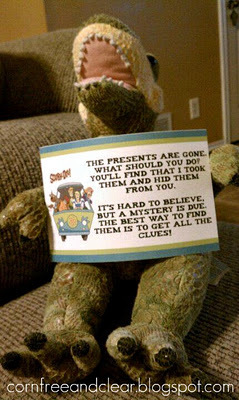 And when they were finished, another clue was waiting for them in the back of the bag where I had put the tails. 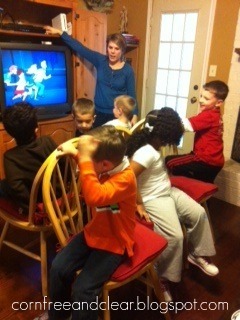 Time for Musical Chairs! I put in a Scooby Doo episode in the DVD player and used the Scooby Doo theme song as the music to play the game. I never realized how competitive 4- to 6-year-olds could be. Haha! When the winners were crowned, they found the fourth clue taped to the back of the DVD case. Man, that monster thought of everything! Although, this wasn't part of my original plan, the kids decided it would be fun to act like Scooby and eat their snacks underneath the kitchen table. So even the kids were getting creative with the theme of the party! And lo and behold- there were the presents back in the living room! 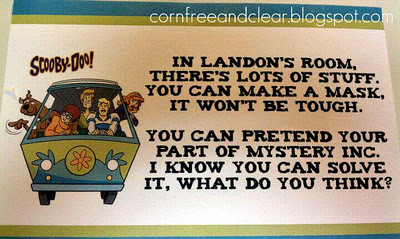 What a fun mystery and a great way to keep the kids entertained and engaged throughout the party. From start to finish, the party lasted an hour and a half. Since I had set the time frame of the party as 2 hours, we used the last 30 minutes to play with the presents Landon received and run around outside and expel some energy. Overall, I think the kids had fun! As parents came to pick up their kid, Landon gave each of his friends a "Doggy Bag" I had made. Using just basic brown paper sacks, my friend who made the cookies had individually-wrapped some for the treat bags and I also included a Scooby Doo toy. I punched two holes in the top of the fold and put orange grosgrain through. 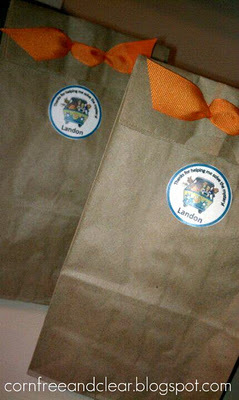 I had printed off stickers to put on each bag thanking the kids for helping Landon solve the mystery. 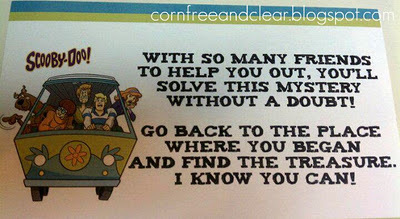 Zoinks! Now THAT was a fun mystery party! 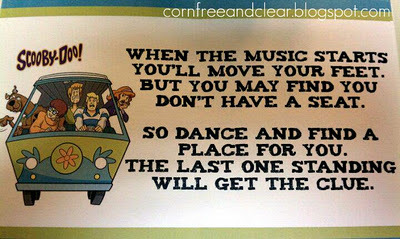 And it was 90% corn-free, which was a huge bonus!